Camp Dewan is now providing 90% of its own electrical power. The installation of solar panels on the barn roof was completed in June 2008. The best location for a solar panel installation is a south-facing location with little or no shade. The barn roof at Camp Dewan is the perfect application. The 78th solar panel was installed and the system went live on Thursday, June 12, 2008. Wisconsin has wonderful incentives for renewable energy. Focus on Energy, a Wisconsin organization that promotes renewable energy initiatives, is paying for 25% of the cost of the installation. Wisconsin Energies, our electrical utility company, provides an incentive to sell renewable electricity directly to them with their Energy for Tomorrow Program. The program "buys" renewable energy at about twice the rate that we're paying them for electricity! 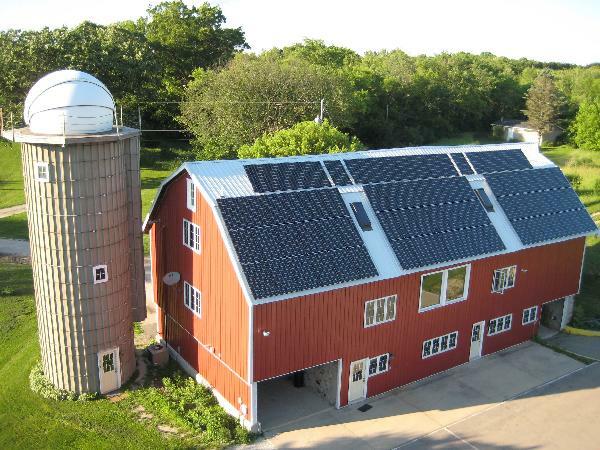 H&H Solar Energy Services of Madison, Wisconsin installed a 16kW solar electric system on the roof of this barn in June of 2008. What is a solar electric (PV) system? Copper circuitry is inlaid into sheets of silicon. When the sun hits the silicon, the photons excite the electrons and a current is produced. A collection of silicon cells form a panel, a collection of panels forms an array. In the case of Camp Dewan, seventy eight Kyocera KD 205 (watt) GX-LP panels make this a 16kW (78x205 watts = 15,990 watts, or 15.99 kW). What are the boxes on the wall of the barn? The boxes on the wall are called INVERTERS. Power generated by the solar array is DC power. The inverters change the DC power to usable AC electricity. These are grid-tie inverters, meaning the power is suitable for use by the Utility providing power to the customer – in this case Camp Dewan. The inverters are SMA Sunny Boy 7000 (watt) grid tie inverters. The system is designed to last at least forty years. The panels are guaranteed to deliver 80% of their rated output for twenty five years. There are no moving parts, so there is very little maintenance. Focus on Energy (www.focusonenergy.com) provided funding for this project. Electricity from Camp Dewan is purchased by We Energies at a higher electric rate through the Energy for Tomorrow Program.